Perfect View, Delicious Beer. Tomorrow, Celebrate Both At The Virginia Craft Brewers Festival. It’s not easy to keep your eyes on the road here. When the blur of green pine trees passing by outside of the car window finally does reach a gap, it does so instantly, as if curtains on a stage have been yanked aside with one pull. The view that is revealed hardly needs any dramatic introduction. Gently sloping down and then running away from the road, a wide, green valley stretches far left and right, filling in to the furthest edges of one’s peripheral vision. Small hills randomly roll across the landscape as it seamlessly curves upwards into the mountains far away. Peaceful and welcoming, it looks like an enormous green blanket has been thrown over the valley, unfurled from one side as if over a bed, and allowed to gently fall across the entire land. This kind of postcard view takes the breath away, and fills one with speechless appreciation for such natural beauty. Among these hills and down the state roads which branch off now and again, you expect the farms, the quaint bed and breakfasts. So at first, it might seem that another particular trade which has become common here along Route 151 in Virginia’s Nelson County has rooted itself in an unlikely location. But given that at its most basic level, those who practice it work the most natural of elements – grain, hops, water, yeast – craft brewing immediately fits into the landscape. After all, the best examples of their work also have a tendency to leave one satisfyingly without words, after taking that delicious initial sip. No fewer than three craft breweries – Devils Backbone, Wild Wolf, and Blue Mountain – share an address along this road, a concentration that would be surprising enough. In fact, they are a part of a larger group of local breweries including those in nearby Charlottesville and Crozet, all of which have become known collectively as the Brew Ridge Trail. The name combines an affection for the area’s plentiful natural beauty with this interesting concentration of five total craft breweries within a relatively small area. Thankfully for fans of the breweries, these breweries coexist here rather well, too. They not only produce a wide variety of beers on their own, but also have worked together to create a few collaboration beers to celebrate special events, such as American Craft Beer Week, held earlier this year. Perhaps the most notable event of all for the area will come this weekend, however. While not officially the center of Virginia’s growing craft beer scene, the Brew Ridge Trail may well feel like it on Saturday. The Virginia Craft Brewer’s Festival, held on the grounds at Devils Backbone, is the culminating event for the state’s first official Craft Beer Month. 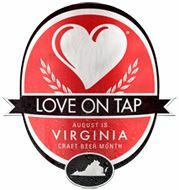 Roughly twenty five Virginia based craft breweries are scheduled to attend, each bringing examples of their craft beer for competition, but more importantly, to celebrate what is an increasingly popular craft beer scene in the state. During the festival, both the brewers and those who attend will be hard pressed not to let their eyes wander a little. The grounds at Devils Backbone, like so much of the area, are surrounded by beautiful, panoramic views of the Blue Ridge Mountains to nearly every side. As sampling glasses of some of Virginia’s best craft beer are tipped back against the green, awe inspiring backdrop of such natural wonder, one might lose their concentration for a moment. For certain, it won’t be for lack of delicious, hand crafted beer. Within the split second the beer is tasted, if one does take in the sights around them, they’ll only realize they have stumbled upon the most satisfying beer pairing they perhaps have ever experienced so far: Virginia’s natural beauty, perfectly combined with its passion for making delicious, craft beer. Visit the Brew Ridge Trail website here! ~ by thebeerroad on August 24, 2012.